Game of Thrones Silver Iron Throne Tankard (Zavvi Exclusive) | Nerd Much? I have a strong feeling that we’re all going to need a giant beer at the end of this final season of Game of Thrones. I know I’m not the only one, right? 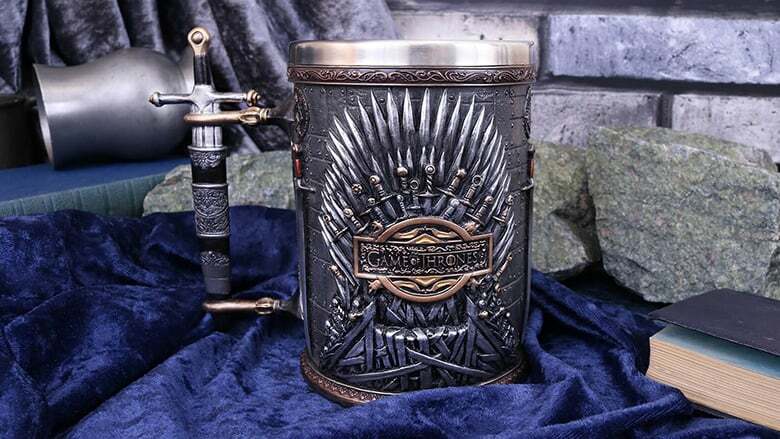 Luckily, Zavvi has just launched a brand new exclusive Game of Thrones tankard that’s going to give us something to put that beer in after the final episode. The officially licensed Silver Iron Throne Tankard is incredibly well-designed and it includes a sheathed sword for the handle, a sizeable iron throne with the Game of Thrones logo in the center of it, and three house sigils: the golden lion of the Lannisters, the silver direwolf of the Starks, and the red fire and blood sigil of the Targaryens. It stands at 13.5cm tall and can hold just over 20 ounces of your favorite ale. The level of detail here is unprecedented. The design on the top and bottom of the tankard looks like it was pulled right out of the show’s intro, with that same bronze and brown colorway that we’re all so familiar with by now. It’s a beer mug that’s fit for whoever sits on the Iron Throne at the end of the season. What’s especially great about this brew-holder is that it has a removable stainless steel insert, which makes cleaning super easy. The Silver Iron Throne tankard is a limited edition, as there are only 400 of them available. So, you might want to pray to the old gods and the new that you’ll be able to get your hands on one before they sell out! Check out more cool Game of Thrones stuff here.